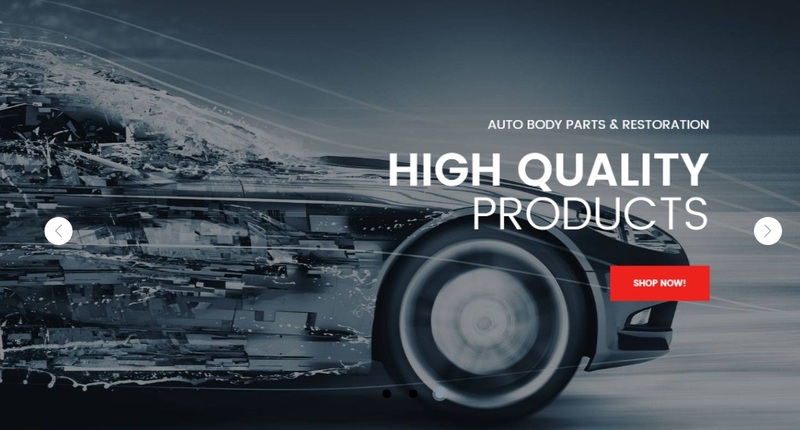 If you want to create a car spare parts ecommerce shop on the basis of Magento 2, we know how to help you. It is not necessary to install tons of various Magento 2 extensions and hire a team of designers. 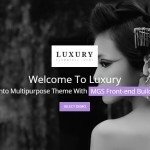 Simply choose a special Magento 2 theme and get a fully-featured ecommerce website. 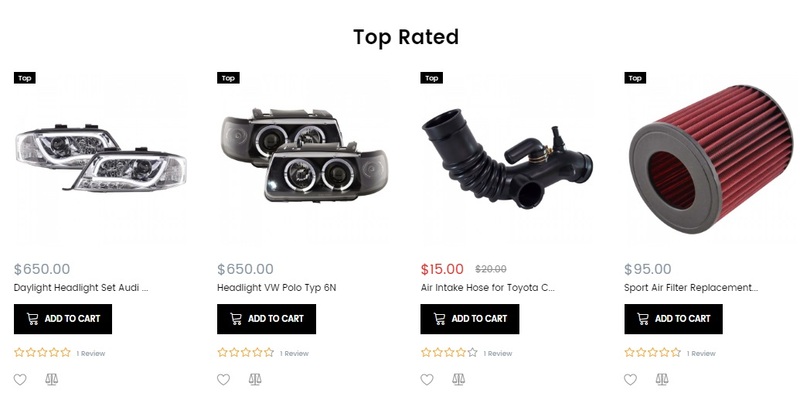 Below, we describe the TemplateMonster Car Spare Parts Magento 2 that is mobile friendly, user-oriented, and equipped with various important tools. Note that the TemplateMonster Car Spare Parts Magento 2 theme is a part of the Magetique family. 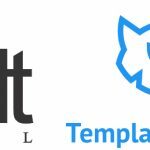 It means that the template offers top-notch functionality and stunning design. You get all the most important features as well as visual improvements in one single theme. 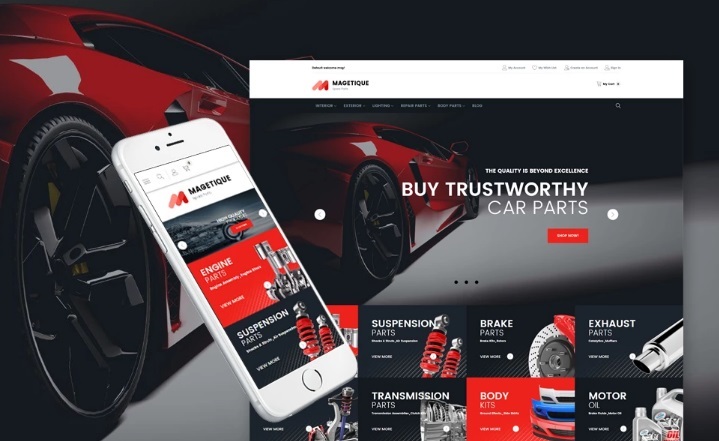 As for the mobile support, it allows you to sell car spare parts to both desktop and mobile users. Two groups of visitors get the same good shopping experience on all possible screen sizes. The powerful mega menu allows to create much better navigation by improving the default main menu. You can place various content there as well as add more links and change the default layout. A more powerful solution is represented by this module: Magestore Mega Menu Magento 2 Extension. Various sorting options are also designed to provide better shopping experience. First of all, they help to reorder products on a category page. Next, you can select the amount of items per page as well as switch between grid and list layout. And of course there are various filters designed to narrow down the selection of goods. As for the AJAX search, it not only allows to find products faster, it also allows to find them on any page. And there is the autocomplete functionality, so you can narrow down the selection of items by typing more characters. As for the newsletter popup, it is the best way to attract the attention of store visitors to the newsletter. While some of them will reject your proposal, the others will subscribe to your newsletter, so you will be able to promote new goods and special offers among them. In case you a wondering why product labels are necessary, here is a brief explanation. 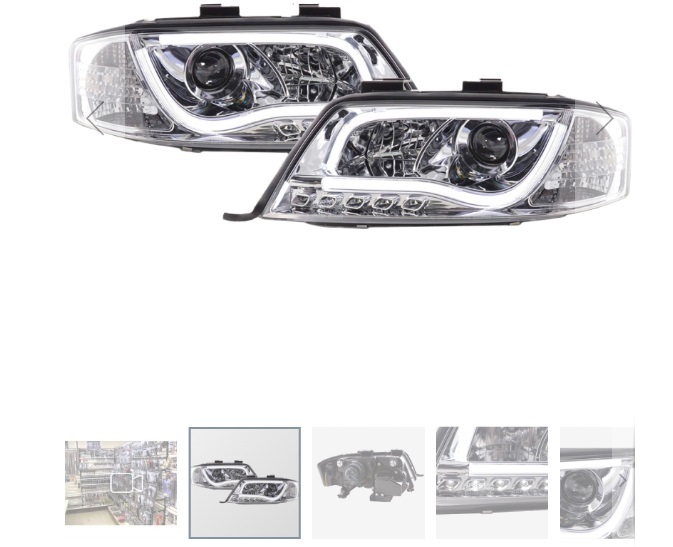 This design improvement allows to attract the attention of customers by indicating certain product features or showing that it is new or on sale. Don’t use badges to much, since they will lose their effectiveness. The best product label extensions for Magento 2 are compared here: Magento 2 Product Labels Comparison. As for the built in blog, it works as a usual blog: you create posts in the backend and publish them on frontend. The solution is simple and easy to use. At the same time it include all features necessary for rapid blog writing. Site Maintenance – inform customers about site maintenance in the most gentle way. 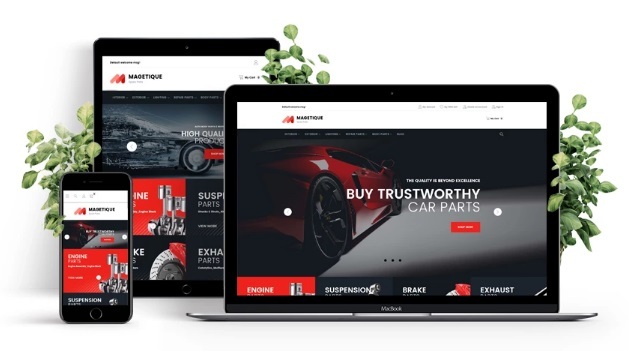 Before starting our review, we’d like to draw your attention to the fact that the TemplateMonster Magetique Car Spare Parts Magento 2 theme offers 4 color schemes and various lauout for homepage, product and category pages, header, footer, etc. We will describe only one combination of layouts. Theme logo + main menu + search. Below the header, you can see a huge slider. You can use it to promote nearly everything. Next, there is a product carousel where you can add products to cart/wish list/compare or review. Product image, label, price, and name are displayed. You can discover more blog extensions for Magento 2 here: The Best Blog Extensions for Magento 2. 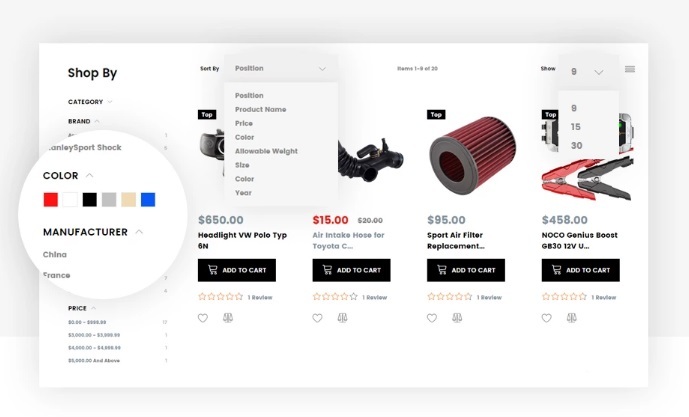 On a category page, you can sort product by position, price, name, color, weight, size, and year. Next, select the amount of items per page and choose the layout (grid or list). As for filters, only one parameter can be applied at a time. Note that the amount of available items is displayed in front of each parameter. To fix the problem with filter parameter limitations, install one of the following extensions: Magento 2 Layered Navigation Comparison. 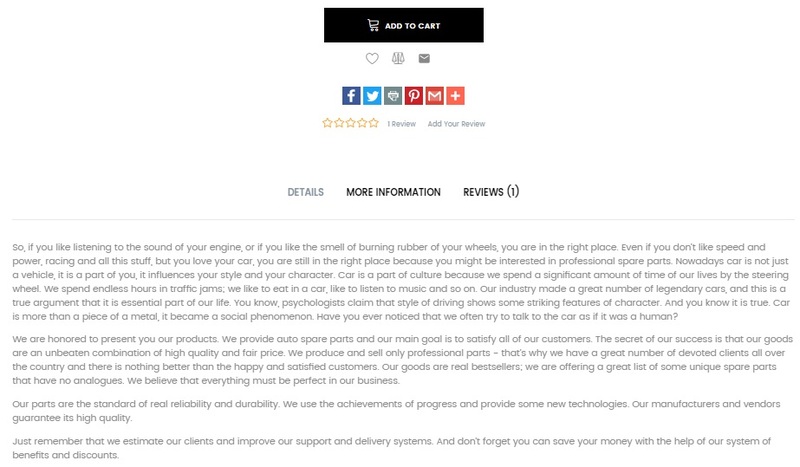 And this is a product page with a vertical 1-column layout. 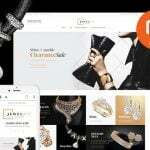 The first element is a product image and a gallery. 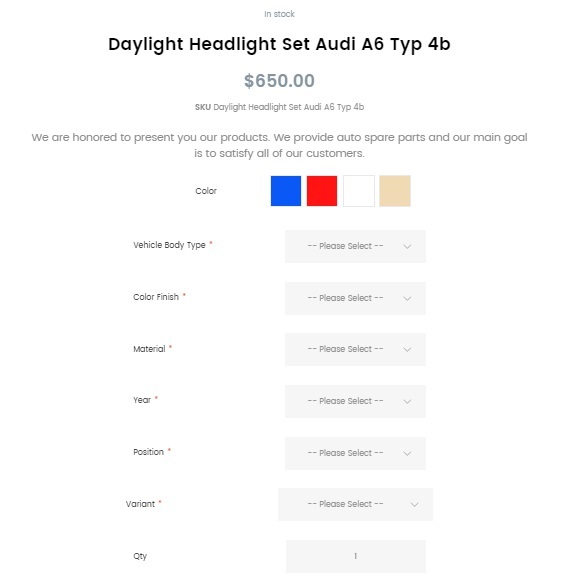 Next, you can see product price, name, SKU, short description, and various configurable options. Add to cart/wish list/compare + social sharing buttons are displayed below. Besides, there are three tabs with full description, additional information, and reviews. Below, you can see various product carousels with related products. 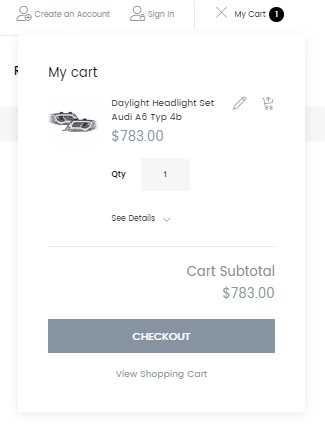 The mini cart widget allows to view product details as well as edit them. Besides, you can check cart subtotal, go to a cart page, and proceed right to checkout. On a shopping cart page, the same options are possible. At the same time, you can calculate shipping and tax and apply discount codes. The checkout procedure is quite common: it consists of two steps and provides a tiny order summary section on the right.